For those of you who track this blog over time, you will know that we have been following a Great Horned Owl family that nests in the foothills near our house. This year the family raised 4 chicks. 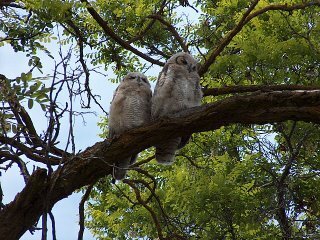 The first owlets fledged just before we left on our trip to St Croix (story below). Today, Karyn and I went out searching for the family. 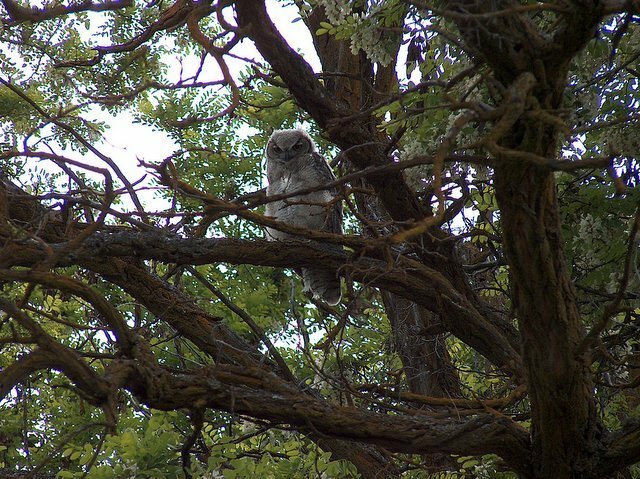 We needed to look no further than the "Owl's Roost" trail in the Boise foothills. We were able to find the mother, father and three of the chicks. We searched the trees, but could not locate the fourth chick. It doesn't mean that it hasn't survived, it could just be hidden from view. We will continue to look for them and will post another message if we find the fourth. Here are photos of the three chicks that we found. We looked in the Redtail nest and all was quiet. They apparently fledged while we were out of town. Redtails soared overhead, but we could not distinguish chicks or adults. Update - 5/29/2006: On our mountain bike ride this morning we took a quick spin down the "Owl's Roost" trail. We easily found all four chicks. Three in one tree and one in the next.